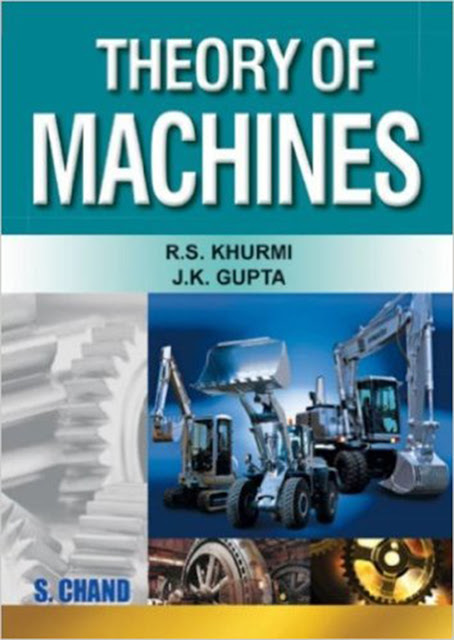 A machine is a device which receives energy in some available form and utilises it to do some particular type of work. 1. Kinematics. It is that branch of Theory of Machines which deals with the relative motion between the various parts of the machines. 2. Dynamics. It is that branch of Theory of Machines which deals with the forces and their effects, while acting upon the machine parts in motion. 3. Kinetics. It is that branch of Theory of Machines which deals with the inertia forces which arise from the combined effect of the mass and motion of the machine parts. 4. Statics. It is that branch of Theory of Machines which deals with the forces and their effects while the machine parts are at rest. The mass of the parts is assumed to be negligible. 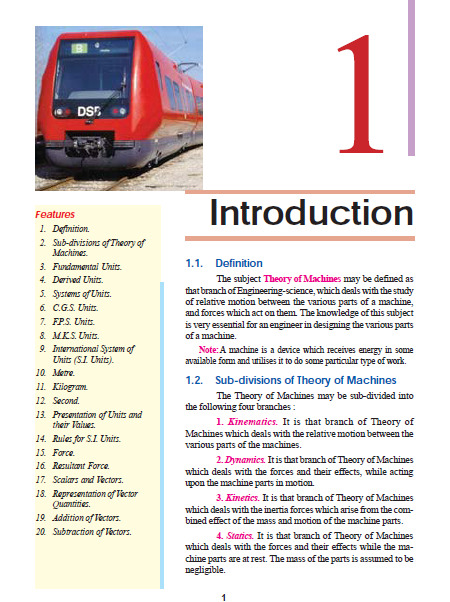 We have discussed in the previous Chapter, that the subject of Theory of Machines deals with the motion and forces acting on the parts (or links) of a machine. 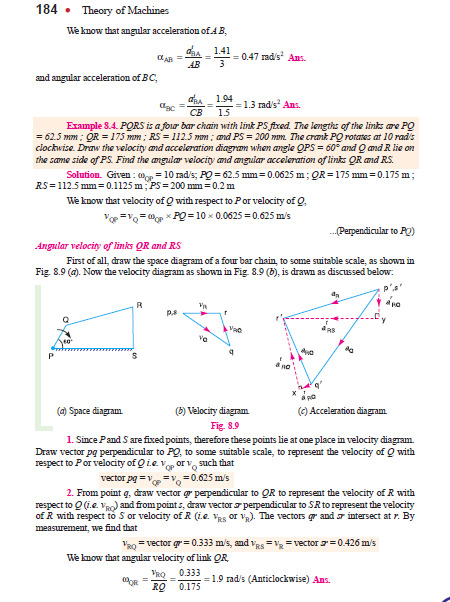 In this chapter, we shall first discuss the kinematics of motion i.e. the relative motion of bodies without consideration of the forces causing the motion. In other words, kinematics deal with the geometry of motion and concepts like displacement, velocity and acceleration considered as functions of time. 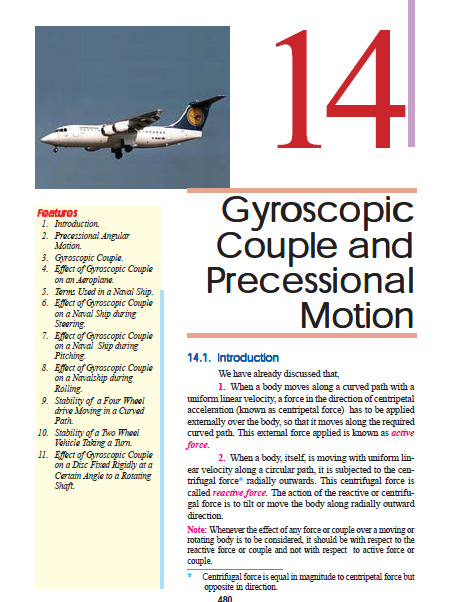 Plane Motion : When the motion of a body is confined to only one plane, the motion is said to be plane motion. The plane motion may be either rectilinear or curvilinear. Rectilinear Motion : It is the simplest type of motion and is along a straight line path. Such a motion is also known as translatory motion. Curvilinear Motion : It is the motion along a curved path. Such a motion,when confined to one plane, is called plane curvilinear motion. 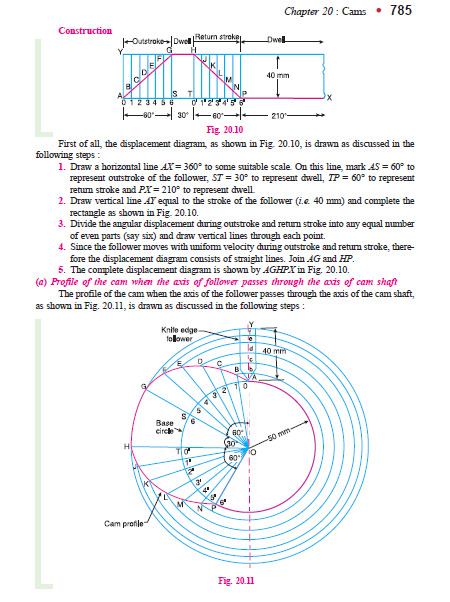 When all the particles of a body travel in concentric circular paths of constant radii (about the axis of rotation perpendicular to the plane of motion) such as a pulley rotating about a fixed shaft or a shaft rotating about its own axis, then the motion is said to be a plane rotational motion. Linear Acceleration : It may be defined as the rate of change of linear velocity of a body with respect to the time. It is also a vector quantity. the projecting particles opposes the motion. This opposing force, which acts in the opposite direction of the movement of the upper block, is called the force of friction or simply friction. It thus follows, that at every joint in a machine, force of friction arises due to the relative motion between two parts and hence some energy is wasted in overcoming the friction. Though the friction is considered undesirable, yet it plays an important role both in nature and in engineering e.g. walking on a road, motion of locomotive on rails, transmission of power by belts, gears etc. The friction between the wheels and the road is essential for the car to move forward. 1. Static friction. It is the friction, experienced by a body, when at rest. (a) Sliding friction. It is the friction, experienced by a body, when it slides over another body. (b) Rolling friction. It is the friction, experienced between the surfaces which has balls or rollers interposed between them. (c) Pivot friction. It is the friction, experienced by a body, due to the motion of rotation as in case of foot step bearings. 2. Friction between lubricated surfaces. When lubricant (i.e. oil or grease) is applied between two surfaces in contact, then the friction may be classified into the following two types depending upon the thickness of layer of a lubricant. 1. Boundary friction (or greasy friction or non-viscous friction). It is the friction, experienced between the rubbing surfaces, when the surfaces have a very thin layer of lubricant. The thickness of this very thin layer is of the molecular dimension. In this type of friction, a thin layer of lubricant forms a bond between the two rubbing surfaces. The lubricant is absorbed on the surfaces and forms a thin film. This thin film of the lubricant results in less friction between them. The boundary friction follows the laws of solid friction. 2. Fluid friction (or film friction or viscous friction). It is the friction, experienced between the rubbing surfaces, when the surfaces have a thick layer of the lubrhicant. In this case, the actual surfaces do not come in contact and thus do not rub against each other. It is thus obvious that fluid friction is not due to the surfaces in contact but it is due to the viscosity and oiliness of the lubricant. effect of slipping is to reduce the velocity ratio of the system. In precision machines, in which a definite velocity ratio is of importance (as in watch mechanism), the only positive drive is by means of gears or toothed wheels. A gear drive is also provided, when the distance between the driver and the follower is very small. transmitted by two toothed wheels, consider two plain circular wheels A and B mounted on shafts, having sufficient rough surfaces and pressing against each other. When elastic bodies such as a spring, a beam and a shaft are displaced from the equilibrium position by the application of external forces, and then released, they execute a vibratory motion. This is due to the reason that, when a body is displaced, the internal forces in the form of elastic or strain energy are present in the body. At release, these forces bring the body to its original position. When the body reaches the equilibrium position, the whole of the elastic or strain energy is converted into kinetic energy due to which the body continues to move in the opposite direction. The whole of the kinetic energy is again converted into strain energy due to which the body again returns to the equilibrium position. In this way, the vibratory motion is repeated indefinitely.